Basically, it’s two chairs arranged around a desk/treasure box. There are 36 innnnnnnteresting questions engraved into the lid of the treasure box, and the idea is that you answer the questions with your sweetie to gain Profound New Insight into one another. 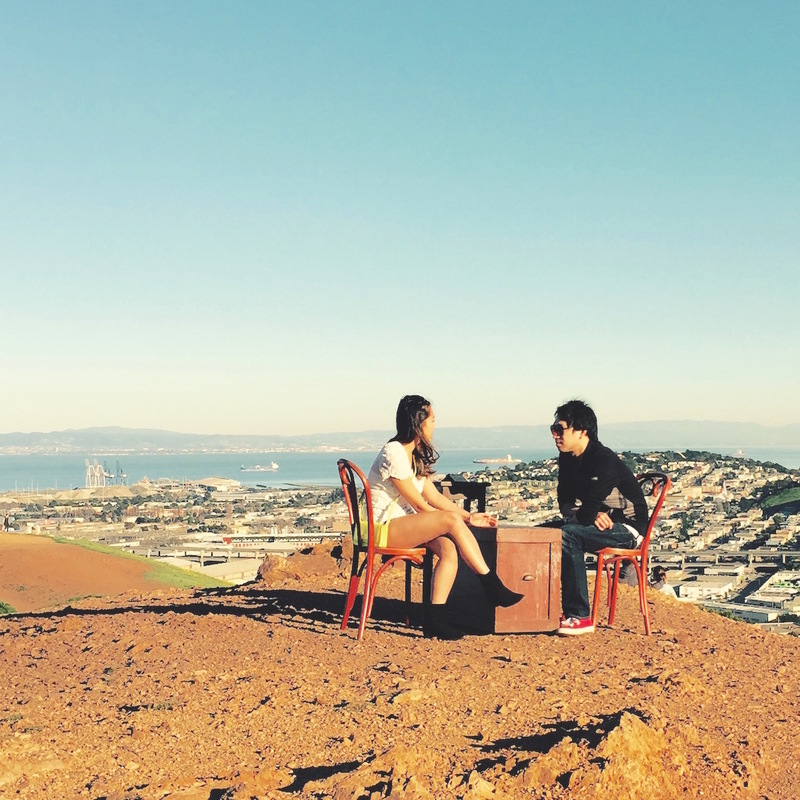 It’s a little bit like The Dating Game, only more intimate, and the prizes are more clever, and it’s on Bernal Hill, atop that mini-peak along the Folsom axis just below the guard rail. By now we’ve all seen that “36 Questions to Make You Fall in Love” article in the New York Times. Local artists Mustafa Khan and Chris McCoy decided those questions need to get out in the open this Valentine’s Day. 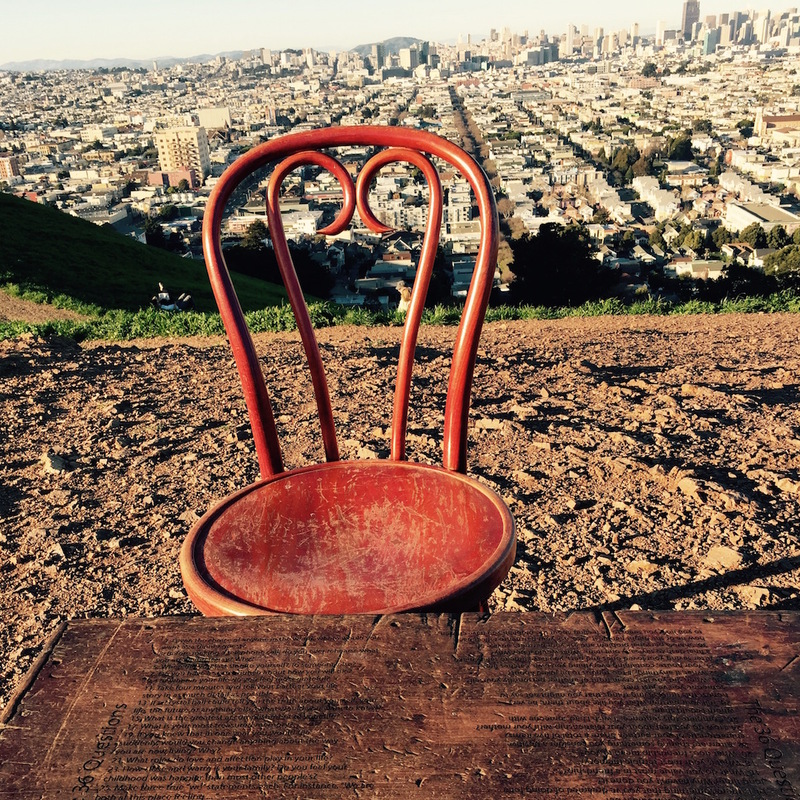 He engraved the questions on an antique treasure chest alongside a set of chairs and a “not reserved” sign on Bernal Hill. You and your date (or a total stranger) can sit at this table and fall in love with the killer view…and maybe each other. Khan says there’s also a “special surprise” inside the chest, which will be at the top of the staircase on Ellsworth and Bernal Heights Blvd until next Sunday. Got that? Get there before Feb. 23, and enjoy. It’s now called “18 Questions” because half the questions blew away. I call it rubbish. A nuisance. It’s a fine line between placing art in a public space, and abandoned junk in a public space. I like the sentiment, not the execution. It was a beautiful idea and we thoroughly enjoyed the hour we spent reading each other the 36 questions atop our fabulous hill.